The South coast of Barbados, offers the best beaches for surfers. From South Point, (The Lighthouse) and moving to the west coast, beginners and surfing experts or professionals can surf the waves at Freights Bay in Christ Church, Dover & Brandons in St. Michael, Batts Rock, St. JamesMullins, St.Peter and Maycocks, St. Lucy. On the east coast, the most famous beach is Bathsheba with the "Soup Bowl," where competitions are held each year. Here's our list of companies offering surfing, kitesurfing, windsurfing and kayaking equipment and lessons. Club Mistral Barbados, Maxwell Main Road, Christ Church, 428-7277. Club Mistral is the base for windsurfing, kitesurfing and surfing in Barbados it's operations are at Silver Sands beach, Christ Church. deAction Beach Shop, Silver Sand, Christ Church. 826-7087. You can get windsurfing, surfing and kitesurfing lessons as well as rent equipment. You can also repair your boards or purchase new. The shop also sells kayaks and boogie boards. Zed's Surfing Adventures, Inch Marlow, Christ Church, 428-7873. Zed's offers exciting kayaking, snorkeling and turtle trips along the beautiful coast of Barbados as well as hiking, island tours and a fleet of luxury sailing catamarans. As well Zed gives surfing and kayaking lessons. 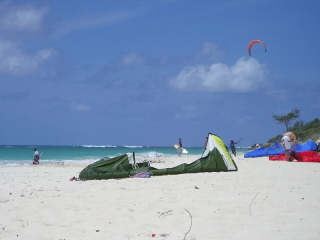 Windsurfing, kitesurfing, kiteboarding and surfing are all available at KiteSurfBarbados. Surf Barbados, 13 Mount Clapham, St.Michael, 262-1099. This site is for surfers, everything is arranged for you... Accommodation, vehicles, boards, lessons and tours. Carlisle Bay Centre, Bay Street, Bridgetown, St. Michael, 426-6101 or 427-4735. Head on over to Carlisle Bay to rent your kayak. Ocean Adventures, 69 Clerview Heights, Stage 1, St. Michael, 438-2088. Ocean Adventures offers exciting kayaking, snorkeling, hiking and turtle encounters. Surf Barbados, 256-3906. You get a complete package here - accommodations, rental car, lessons, tours and board rental. Barbados Blue, Needham's Point, St. Michael, 434-5764. Windsurf, jet ski or discover sunken treasures. The Waterman Festival celebrates surfing, wind-surfing and kite-surfing with an exciting series of competitive events. It lasts for three weekends surrounding the first two weeks in February. Activities will take place all over the island, but has been centered around the Silver Rock Beach Resort, Christ Church, in past years. The Barbados Windsurfing Championships are held in mid-January at Silver Rock Beach, Christ Church. 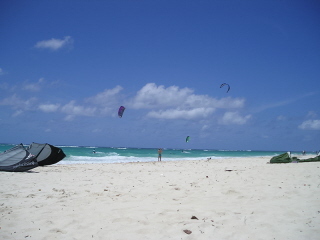 The Barbados Windsurfing Village, 428-9095, for the windsurfer crowd! Caribbean Kayaking Alliance, Kayaker's Point, Inch Marlowe, Christ Church, Barbados. Silver Rock Windsurfing Club, Christ Church, 428-2866.